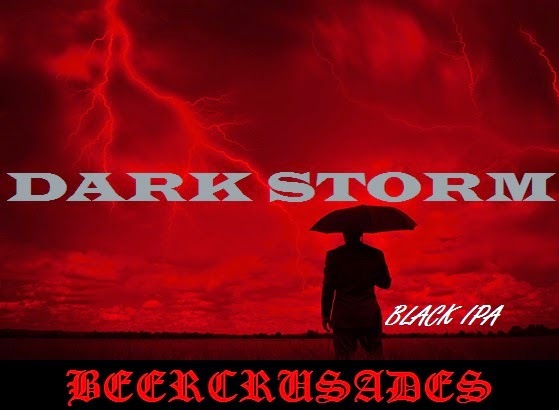 As promised, Here is some tasting note for Version 2 of Dark Storm. the idea behind this version, was to increase the hop flavour and complexity across the board. I can say this much now, I failed in that respect, the reason is because I beat my target gravity by a staggering 4-5 points. So I hit 1.067 OG prior to fermentation. I did increase the malts by 200 grams, but wouldn't have thought this would've increased it by this much. I'll put it down to missing water. I missed my volumes by 2 litres, and originally hit 1.072 somehow, I was sure I put the correct amount of water in, but clearly not. so as you will see from the picture, this has come out more brown than black, due to the top up water added. Which put me down to 1.066/67. Coupled with these issues, I had a miss cue on Fermentation, meaning I missed my target Og by 2 points as well. hitting 1.018, rather than the previous 1.016, which again will probably be down to increased viscosity and increased OG from the originally 1.062 last time. Aroma: Some dark Malts, roast aroma only slight but noticeable none the less. Big hits of Grapefruit and some of that lovely Mosaic pokes through, however it seems to be hidden behind the Simcoe somehow..... I realise its a powerful hop, but for me it doesn't work in a dark beer. Appearance: Brown Rather than black like last time, this is due to top up water, which is a shame. there is also some haze on this one, most likely hop haze. It's not a big deal in terms of a dark beer, but it is noticeable, due to the lighter than normal appearance. I'll also put this down to US-05 rather than M44. head retention is good. Flavour: More of the aroma, although some minor alcohol notes here as well, nice big grapefruit/lemon flavour with a saturation of Mosaic in the mix. the dakre malts don't play as well as I'd hoped for with Simcoe, and I don't really get much from the Special Roast. Mouthfeel: this is a bit thicker than I like, there are some unfermented sugars at play here. the 1.018 is too high, and this works much better at 1.016. Guess it goes to show you those extra two points can make a big difference. Overall: This is a good beer, but some clear issues arose from what I mentioned above. I know where to take it from here which helps, but it'll be back in the direction of the original recipe. So, where to from here for this beer. I'll be going back to what made this beer such an inspiration last time, the fruit from the hops played really well with some of the increased roast flavours in the mix. Yeast I may go liquid, or may just head back to MJ44, while I nail down the recipe. Special roast is out, it didn't add much top the recipe, and while I don't think it contributed to haze or lack of colour, if I go back to the original, then I know where I stand. Hops - I'll continue to experiment with more fruity options, the Simcoe doesn't work on this, next time will probably be Galaxy, in the later additions. On another note, my Belgian Blond is in down and seems to be pretty happy. I kept things nice and simple, I'm looking to build a base and work from there. so just pilsner malt, candi sugar (Homemade) 100% Pacifica hops, this way I can enter into the upcoming SMaSH comp at the local brew club. 1.066 hit, fermented with the slurry of WLP500 from Back Up Plan III. Next up will be Promised Land II for a mates Stag Party.